Proof coins appeal to an entirely different set of numismatists. While bullion coins are preferred by investors for their purity and design, it is the enhanced design of proof coins that makes them particularly attractive to collectors who value improved visual appeal. The 2004-W ½ oz Proof Gold American Eagle is currently available on Silver.com in perfect condition, but only while supplies last! Arrives in a protective plastic slab courtesy of the PCGS. 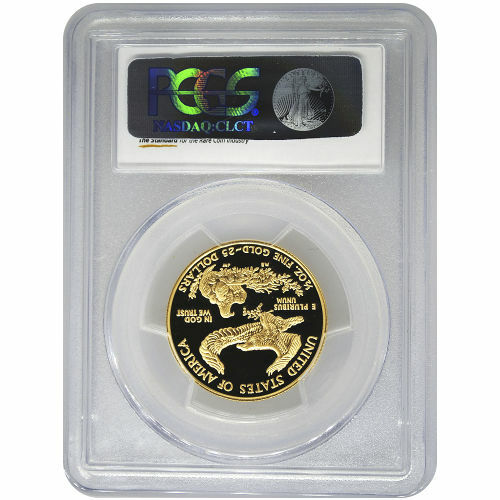 Eighteenth release of ½ oz Gold American Eagle coins! Bears a face value of $25 (USD) backed by the federal government. Issued a grade of PR70 by the Professional Coin Grading Service. The Professional Coin Grading Service is one of the world’s two preeminent coin certification services, the other being the Numismatic Guaranty Corporation. When the PCGS judges a coin’s condition as PR70, it indicates the product is in perfect condition according to highly respected experts in the field. Proof 70 is the highest grade a proof coin can earn. The Sheldon numeric scale is used to assign a number value to any coin, and correlates to its overall condition. The scale runs from 0 to 70, with 0 being the lowest possible grade and 70 the highest. 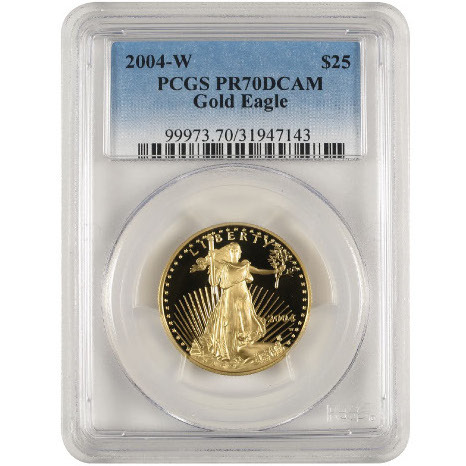 Each of the 2004-W ½ oz Proof Gold American Eagles in this product listing is in perfect PR70 condition. According to the PCGS, this indicates a coin with its full, original mint luster and no detracting flaws of any kind. The Deep-cameo designation is reserved for proof coins with a strong, frosted finish on the design set and a deeply-mirrored, clear background field. Together, these appearances combine to give the viewer the impression that the design set is floating above its background field. Augustus Saint-Gaudens’ 1907 depiction of Lady Liberty was chosen for the obverse design of all Gold American Eagle coins. Miley Busiek created the exclusive bald eagle image used on the reverse of these coins in 1986. Gold American Eagle fractional-weight coins were originally produced at the Philadelphia Mint from 1987 to 1993. Since 1994, all fractional-weight coins have been struck at the West Point Mint in New York. If you have questions, please reach out to Silver.com at 888-989-7223. You can also connect with us online through our live chat and email services. If you are looking for similar products, check out our collection of Gold Eagles.